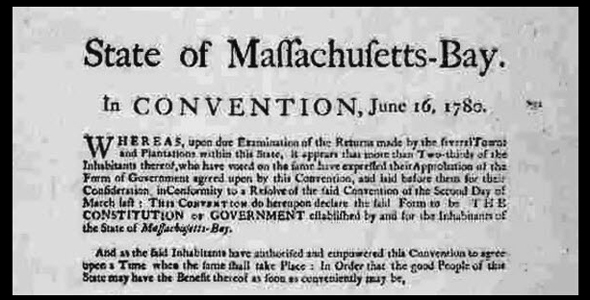 Researching the way Massachusetts was created as a matter of law through its chartering documents is really easy, isn’t it? So getting ready to talk about the law to bunches of Massachusetts genealogists on Cape Cod this Saturday — it’s a joint session of the Cape Cod Genealogical Society and the Falmouth Genealogical Society at St. Peter’s Episcopal Church in Osterville — should be a piece of cake, right? Sigh… it’s never that easy. Not even in a place like Massachusetts. Is that complicated enough for you? How about if I add in the total-by-now of 120 amendments and all the ones proposed and not adopted? Fortunately, for all of this, Massachusetts makes it as easy as it can be, for a rather complex topic. The Massachusetts Constitution, with a comprehensive note as to amendments proposed and rejected, is set out at the Massachusetts legislature’s website. • Mayflower Compact: Agreement Between the Settlers at New Plymouth, 1620. • Charter of New England, 1620. • Charter of the Colony of New Plymouth Granted to William Bradford and His Associates, 1629. • Charter of Massachusetts Bay, 1629. • Act of Surrender of the Great Charter of New England to His Majesty, 1635. • Surrender of the Patent of Plymouth Colony to the Freeman, 1640. • Commission of Sir Edmund Andros for the Dominion of New England, 1688. • Charter of Massachusetts Bay, 1691. • Explanatory Charter of Massachusetts Bay, 1725. No, constituting Massachusetts, as a matter of law, ain’t easy. We love our complicated okd state! Thank you for a comprehensive list of resources. Another great blog post.